Destination wedding planner in Udaipur is blessed with an opulent history of Rajput and Mewar kings. This is the reason Udaipur is flourished with many majestic palaces and courtyards, which are later on converted as venues to host events like weddings, sangeet, cocktail parties, wedding ceremonies and other events. Udaipur is the most romantic place because of its splendid natural beauty of Lake Pichola, this is the reason Kings of Sisodiyas and Rajputs built their leisure holidays palaces in Udaipur. History is continuing after the decades and today, Udaipur is the most favorite place for destination wedding lovers. 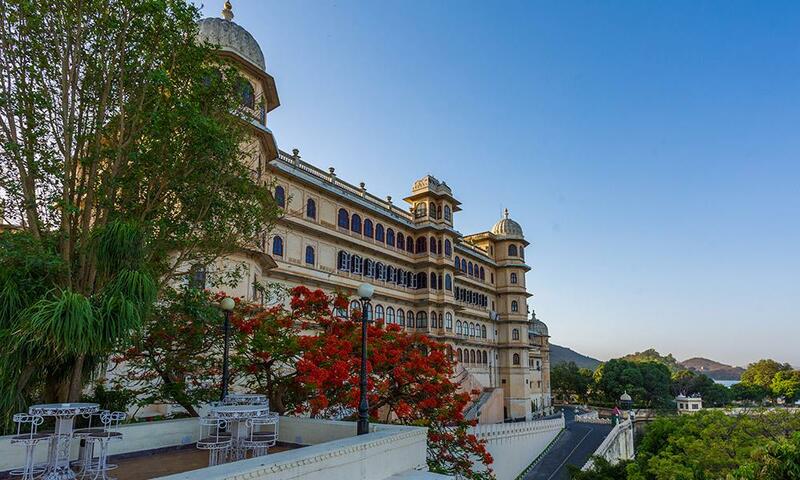 Udaipur is known for a regal and traditional theme-based wedding, Wedding couple chooseUdaipur for royal picturesque palaces, Hawelis, courtyard walls decorated with mural paintings, luxuriant interior with large and royal chandelier, sparkling fountains and lush green gardens. Udaipur is also known for heartwarming Rajasthani hospitality and lip-smacking Rajasthani cuisine. Udaipur has plenty of options of wedding venues for destination weddings like luxury hotels and resorts, Hawelis, Palaces, Budget wedding venues, luxurious wedding venues but if you are thinking to plan something unique and special for your big wedding day then Dreamz wedding planner will tell you some beautiful and unique wedding venues in Udaipur. Zehana Mahal is an integral part of City Palace Udaipur. In 1600 century Zehana Mahal was built for royal ladies and in 1974 it was converted as Museum, but the courtyard and Royal palace turned into the venue to host royal weddings. Till now Zehana Mahal has witnessed uncountable Royal weddings, Wedding ceremonies, and events. It is one of the splendid wedding venues with a blend of modern and traditional antique royal interiors for the capacity of 200- 500 guests. Zehana Mahal provides wedding celebration spirits to its wedding guest by unique light settings, Royal large chandeliers, and glittering fountain. Zehana Mahal is located at the end of the City Palace. it provides Red carpet to walk on to reach, which gives a royal feel. Zehana Mahal provides large courtyard Laxmi-chowk -(Outside wedding venue ) in the center exclusive for theme weddings. Chawmukha pavilion the central courtyard enlightened with candles and sparkling fountains which gives a celebration feel in itself. Zehana Mahal offers Decorative horses, Palace band, Sehnai and Nagada and welcome their guests with rose petals, Gajras, rose water. Mashaal and Candles in chandeliers enlighten the path towards wedding venue, Flower decked decorated tables, Rajasthani folk dance and music to entertain the wedding guests. Zehana Mahal is such a beautiful and unique wedding venue in Udaipur. Manek Chowk or Manek Mahal is also the integrated part of historic City Palace Udaipur, built by Maharaja Udai Singh II. Manek Mahal is the enclosure for the formal audience in the royal gala event, musical performances and celebration for festivals here. Today Manek Mahal continuing the same royal era by hosting gala weddings, royal weddings in Manek Mahal. Manek Mahal is completely embraced with mirrors on a wall facing the emblems in gleaming brass. Surya Chopar is a reception center in Manek Chowk for gala events or dinner party, cocktail, and wedding, sangeet or ceremonies with a mesmerizing view of Mardana Mahal. Manek Chowk is a unique and royal wedding the venue which offers amazing floral decoration, floral rangoli on the floor, Mashaal, and candle lighting along with the pathway, Welcoming guests with rose petals, palace band, Sehnai and sprinkling rose water. Make your dream more real by planning a royal theme wedding in Manek Chowk. Palki Khana, a European cafe serves a regal dining option for guests who stay there. Courtyard of Manek Chowk lightened with spectacular lights, which reflects the historic glory of Royal Palace. Expert wedding planner arranges amazing and special wedding arrangements for your royal dream comes to be in reality. Mor Chowk is the inner court of the palace. 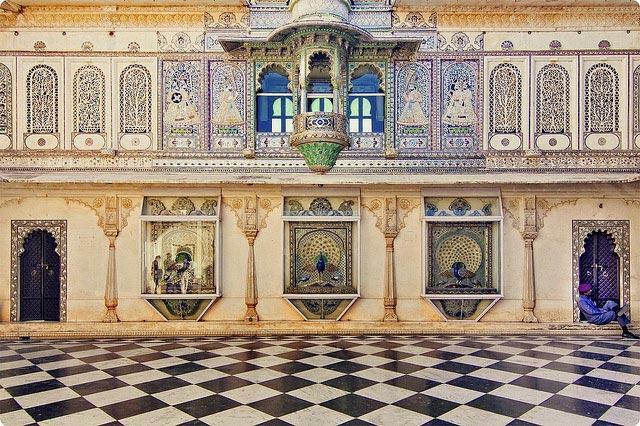 One of the most remarkable constructions in City Palace Udaipur. Mor Chowk has exemplary detailing work on chamber walls with gold, Meenakari work, consisting of three peacocks which are defining three seasons of a year. Mor Chowk is a very unique and extraordinary place for Royal destination wedding in Udaipur. Plan a wedding ceremony in Mor chowk is like living the royalty and luxury in itself. Mor Chowk welcomes their wedding guest with rose petals, Shehnai and traditional music, Alcoholic, and non-alcoholic welcome drinks, Rose petals from the projected balcony which is flanked by mirror glasses. Mor Chowk is an extremely beautiful place for wedding shoots. Kanch -ki-Burj the adjoining chamber of Mor Chowk has crafted walls decorated with mosaics and mirrors. Mor Chowk has sufficient space for 50-100 people to arrange aelegant wedding ceremony. Mor Chowk offers all kind of floral decoration, red carpet arrangement, live Rajasthani music and dance, and serves authentic Rajasthani and multination cuisine for the guests. If you are searching a unique place to arrange a wedding ceremony or arrange a close nit destination wedding. Mor Chowk is the unique wedding venue in Udaipur. 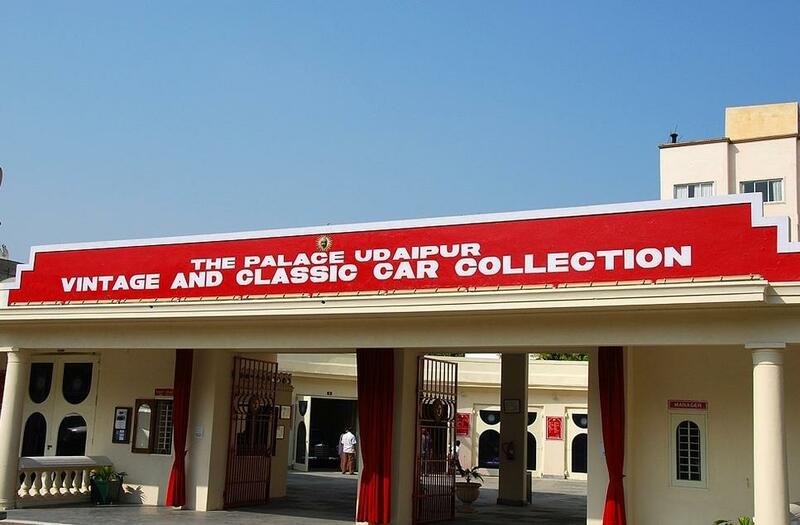 The vintage car collection of Rajput kings of Mewar inaugurated for the general public in the year 2000, since then it has been a landmark for Udaipur. HRH group of hotels arrange regal weddings in unique crescent shape Vintage car museum and converted in unique wedding venue up to 300 guests. 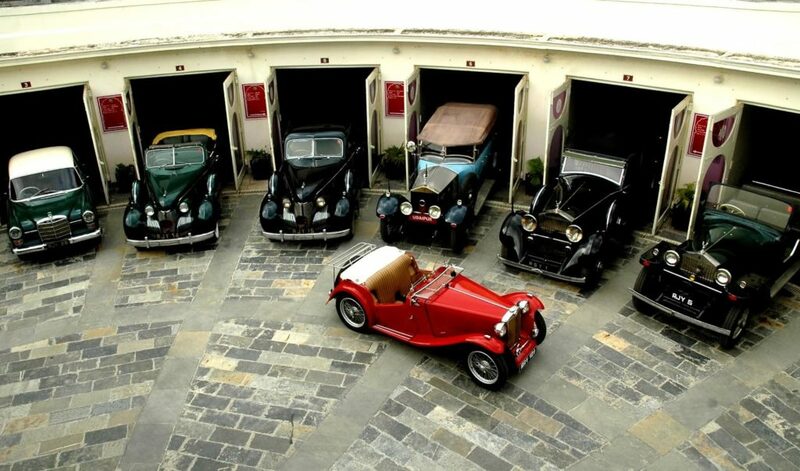 Crescent shape vintage car garage which showcase royal vintage cars like Rolls Royce, Mercedes, Cadillac, MG etc from the house of Mewar converted venue by garden Hotel for cocktail parties, wedding parties, dinner and other destination weddings in Udaipur. Garden hotel offer Wedding lawns, Terrace where a large buffet, wedding ceremonies, a wedding reception can be arranged easily. You can plan a unique and extravaganza royal wedding with vintage car showcase in the background, a destination wedding which defines the royalty in itself. You guest can drive back in time and live the authentic Rajputana style wedding in Udaipur. Garden hotel by HRH Group offers unique royal arrangements for the wedding guests. Shikharbadi palace is a very unique and elegant place in the midst of Aravali hills with an immense view of lake Pichola. Shikharbadi palace was formerly a hunting lodge for Royal families. Shikharbadi palace is owned by HRH Group of hotels which provide elegantly designed rooms and suites with old classic furniture, ethnic decor, old miniature paintings with all modern facilities. If you are thinking to plan an elegant royal destination wedding in heritage hotel Shikharbadi provides you all the facilities, like good accommodation, Heritage champagne palace walks, Vintage cars for pick and drop from airport and city tours, Puppet show, Rajasthani folk music and dance, Fireworks arrangements.